One year ago I dreamed about a cookbook that would save our family meals. My dream book would have recipes that would take less than 30 minutes to make, preferably only 15 minutes, ingredients lists should be nice and short, they would not include gluten, dairy or refined-sugars and most of the recipes should be vegan. The book should offer wholesome recipes for breakfasts, dinners, lunches, snacks and for sweet treats. Kid-friendly recipes would be a big plus and also if the book could also offer better alternatives for pizzas and burgers, my man’s favorite meals. All in all, the recipes in the book should be healthy, super easy and super delicious. Too sad there wasn’t any book like that on the market. I went through a big bunch of cookbooks and waited for a hero that would fly into my arms and save those moments where the stomach is empty and the mind goes blank at the same time. There were nice recipes here and there but a book that would fulfil ALL my needs just didn’t seem to exist. So, I had to make it myself. And I did. Two weeks from here my next cookbook about healthy fast food is going to be released in Finland. The Finnish name is Kiitos hyvää Pikaruokaa, and I’m proud to say that the book offers EXACTLY everything I just described above! I am so thrilled and I can’t wait to get it in my hands – For one since I actually cook the recipes from the book everyday, and I can’t remember all my recipes in detail, and I don’t wanna go on searching for them from my computer all the time, so I really need to get the book in my kitchen and in my hands – ASAP! Gonna let you know more about the book later, but I’m sure you guys are going to appreciate it as well. Who would not love healthy and tasty fast food! But now, to today’s meal! This vegan meatballs and pasta recipe is not actually from my upcoming cookbook, because I created it after the book had already gone to print, but it makes an excellent and simple everyday meal also. 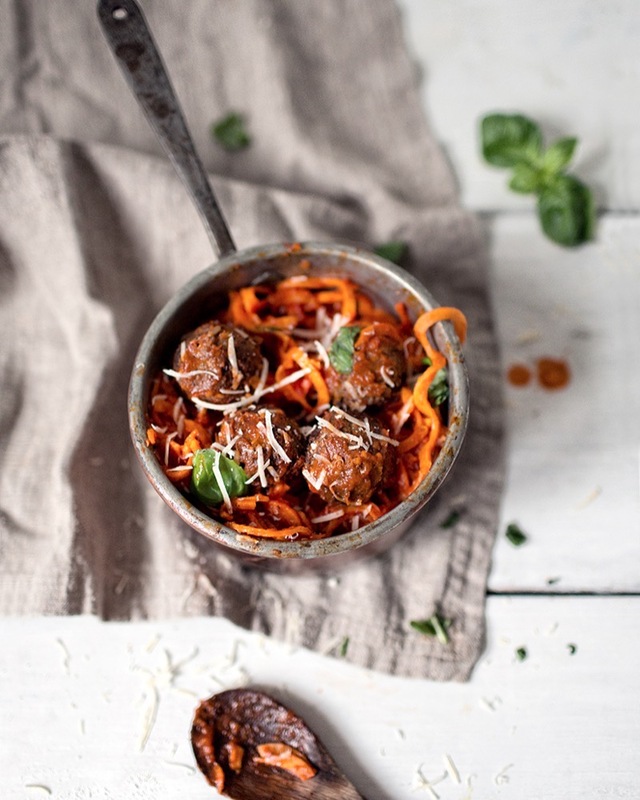 I’m just loving this easy pasta made from sweet potato and the rich taste and great texture of these vegetarian meatballs! 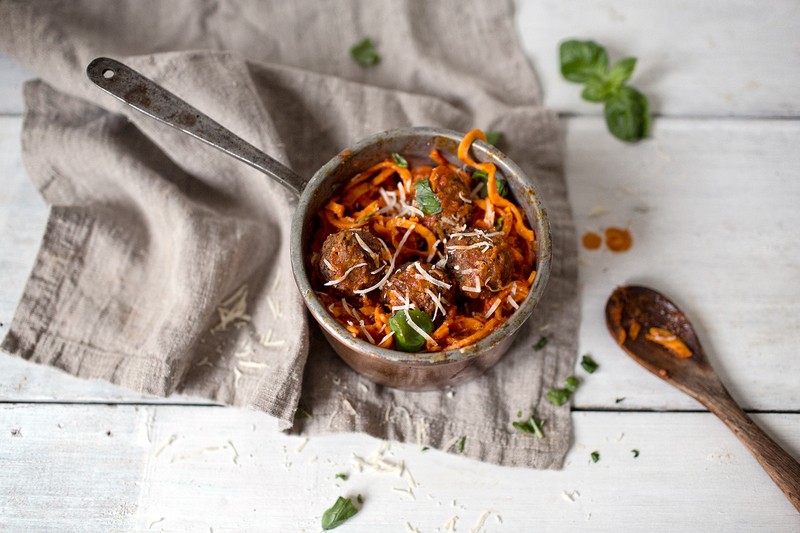 If you ask me it's quite an excellent mimic of the Italian classic meal, with a healthy and fun twist. Preheat the oven to 400 Fahrenheit/200 Celsius degrees. Measure sun-dried tomatoes into blender and blend until quite smooth. Add rest of the ingredients and blend. Pour the dough into a bowl and form small balls with your hands. If the dough feels too wet add a little bit of coconut flour or other flour. Pour generously oil onto a pan and fry the meatballs for about 5 minutes, until they get a nice brown color. Transfer the meatballs onto a baking tray covered with parchment paper. Bake for about 15 minutes. In the meantime prepare the sweet potato noodles. Peel the sweet potato and prepare noodles with a spiral slicer or julienne peeler. Add 1 tbsp oil onto a pan and cook the nools for one minute. Add the marinara sauce and cook for about 10 minutes. Take the meatballs out of the oven. 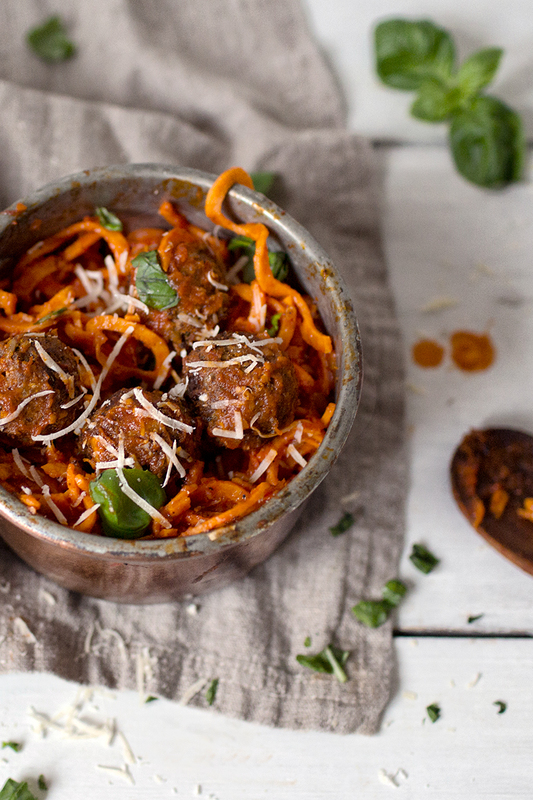 Dose some noodles on plates, add meatballs on top. Grate some vegan cheese or parmesan cheese on top and sprinkle on some fresh basil leaves. Serve and enjoy! Congratulations on publishing a book! I hope we'll get it in English (or Swedish) soon. Any hope for that? The topic sounds amazing. I would surely need healthy fast food recipes! thank you katie! so nice to hear that you like my work! rnand the finnish version of my book will not be in amazon, but lets hope we'll get the english version out soon in one way or another. I'll keep you posted! hugs! yesss i hope there will be an english version! well, one way or another I'll make it happen, I promise. :)rnthank you for the comment! MAHTAVAA! Rakastan aiempaa kirjaasi ja olinkin toivonut jotain tällaista arkiruokakirjaa, jossa sokeri ja viljat loistaa poissaolollaan :) Ja tuo yllä oleva resepti on täydellinen - aineet löytyy valmiiksi kaapista ja se ei sisällä edes mitään perheemme allergeeneistä. Arvaa mitä meillä syödään huomenna ;) Kiitos kiitos kiitos! Nyt tiedän, mitä haluan joulupukilta, kun appi sitä minulta kysyy. siis aivan ihanaa lukea että kirja tulee tarpeeseen! kiitos kommentista. ja toivottavasti sait ohjeen onnistumaan ja perhe diggaili annoksesta! Hei IHAN mahtava uutinen! Tämä menee niin oitis joulun toivelistan kärkeen. Milloin kirja tarkalleen ilmestyy? hei tosi kiva että kiinnostaa! ja kirja pölähtää kaupoihin 10.12. :)rniloa joulukuuhun! Hei mahtavaa, juuri tälläisille arkiresepteille tarvetta!rnrnMitä suosittelisit käyttämään tässä (sekä monissa muissa ohjeissa) noiden pellavansiementen sijaan kun niitä ei oikein suositella raskaana oleville? periaatteessa voisit testata chia-siemenillä tai rouhimalla chia-siemenet rouheeksi vaikka blenderissä. en ole itse tosin testannut chialla, mutta uskoisin että toimii. pitääkin testata ensi kerralla! You. Are. Amazing. This recipe just saved my day. Not to speak of your book announcement. Thank you! thank you darling! your comment just saved mine!